Crystal structure of MxA, highlighting amino acids 561 and 566 in loop L4 (top). Only proteins expressing the human loop L4, either human MxA (hsMxA) or a chimera of AGM MxA expressing human L4 (agmMxA(hsL4)), inhibit replication of a thogotovirus minireplicon (bottom). Image modified from Mitchell, et al., 2012. Over millions of years primates have evolved several proteins that restrict virus replication, and in turn viruses have evolved strategies to evade these host restriction factors. MxA, a dynamin-like GTPase, inhibits replication of several virus families; however, different proteins are targeted by MxA in each virus family, so the inhibitory mechanism is unclear. A recent study published in Cell Host & Microbe led by Dr. Harmit Malik and graduate student Patrick Mitchell (Basic Sciences) in collaboration with Michael Emerman (Human Biology) and Georg Kochs, Otto Haller, and their grad student Corinna Patzina (University of Freiburg and International Max Planck Research School for Molecular and Cellular Biology) used a unique evolutionary approach to identify a major determinant of MxA activity against orthomyxoviruses. 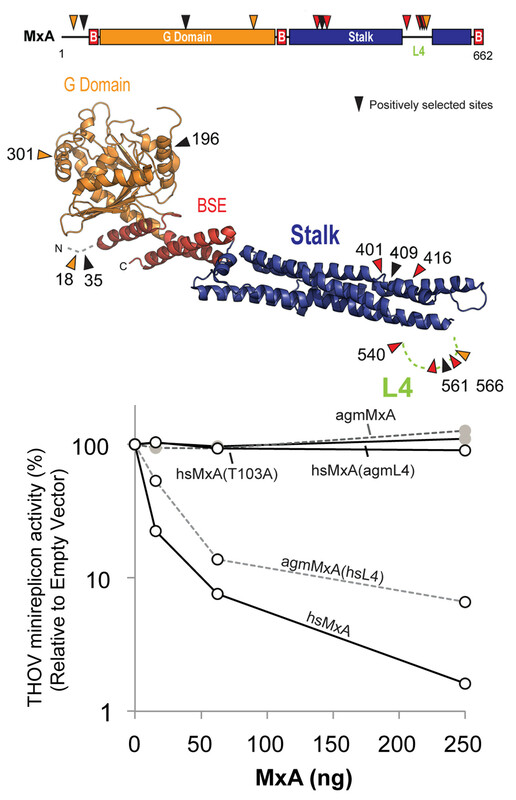 The recently solved crystal structure of MxA confirmed that it resembles other members of the GTPase superfamily, with an N-terminal GTPase domain and a C-terminal stalk linked by a bundle-signaling element. However, the crystal structure did not identify any obvious substructure that might mediate the broad and diverse antiviral activity of MxA. Antagonism between host and virus proteins results in rapid and recurrent evolutionary changes in both proteins, particularly at interacting surfaces. One way to detect these changes is by determining the dN/dS ratio, a measure of the rate of non-synonymous amino acid changes (dN) relative to the rate of synonymous changes (dS) in a gene between two or more related species. High values of this ratio (i.e., dN/dS > 1) indicate that a gene is evolving under positive selective pressure, increasing the prevalence of potential adaptive changes in a population. Low values (dN/dS < 1) are indicative of purifying selection, preserving critical protein structures and functions. Identifying amino acid residues that are evolving under positive selection can help define residues that are engaged in a molecular arms race with viral antagonists. Mitchell et al. compared the MxA gene from primate species representing ~43 million years of evolutionary time to determine whether or not the gene is evolving under positive selection. Across the whole gene, MxA exhibits an average dN/dS ratio of 0.32, consistent with purifying selection. However, investigating the individual domains of MxA revealed that loop L4 of the stalk domain has signatures of strong positive selection (dN/dS = 5.08). While several amino acids in this loop are under positive selection, two residues in particular, 561 and 566, have signs of recurrent selection across several primate lineages, consistent with repeated selection against a viral antagonist. The research team next determined the functional relevance of these changes against thogotovirus (THOV), a virus which is inhibited by human, but not African green monkey (AGM), MxA. Replacing loop L4 of AGM MxA with the human surface conferred the ability to restrict THOV, while replacing the human loop L4 with the AGM suface resulted in a loss of inhibitory activity. Remarkably, exchanging only the amino acid at position 561 also recapitulated the phenotype of the entire loop L4 exchange. A distantly related murine Mx protein expressing human loop L4 also gained robust anti-THOV activity. Both human MxA and the murine chimera bound to THOV nucleoprotein by co-immunoprecipitation. Taken together, these data confirm that loop L4, particularly amino acid 561, is a major determinant of anti-THOV activity, validating the team’s evolutionary approach. They also identified other residues and domains in MxA evolving under positive selection. It is possible that some of these regions may play a role in recognizing diverse motifs from other virus families, contributing to the broad antiviral activity of MxA. Mitchell PS, Patzina C, Emerman M, Haller O, Malik HS, Kochs G. Evolution-guided identification of antiviral specificity determinants in the broadly acting interferon-induced innate immunity factor MxA. Cell Host & Microbe 2012 Oct 18;12(4):598-604.